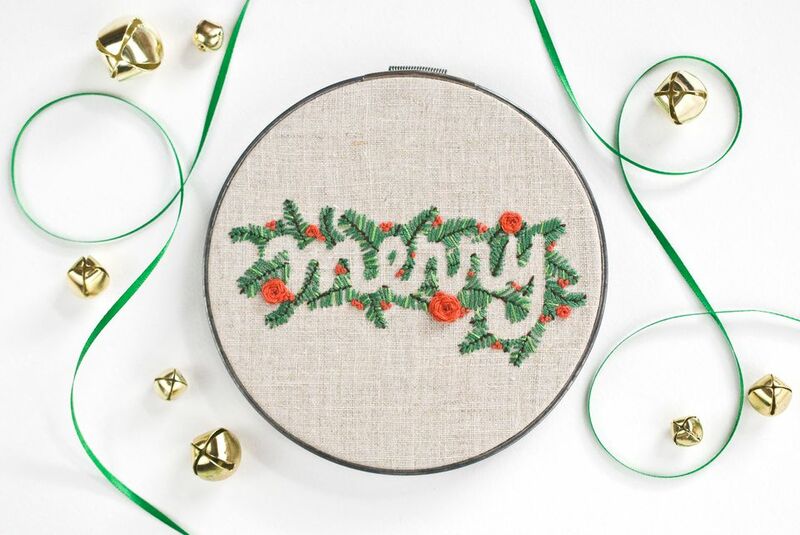 Get ready for the holiday season with some very merry embroidery. Using negative space to display the word merry, this free pattern is both beautiful and easy to stitch. It makes an excellent gift, as well as decor for your own home. Even though it looks relatively detailed, when stitched to fit in a 6-inch hoop, you'll be able to finish this design in a few evenings of steady stitching. With so little time needed to work up some merriment, why not stitch framed hoops or tea towels for all your friends? It would even make a good embroidery for a small pillow! When working on an embroidery that uses negative space, the stitching all happens around the design you are highlighting, which is the opposite of filling in a silhouette with stitches. Because you want the design to show clearly, it's important that the embroidery is dense enough and that the stitches create strong definition around the negative space. You'll most likely find that if you look at the merry pattern at a large size or very closely, you'll have a difficult time seeing the word. If you back away from it or squint your eyes just a bit, you'll see it. Keep this in mind when you choose the size you are stitching your merry embroidery. If you like the idea of stitching a word for Christmas, but merry isn't quite your thing, there are so many holiday text patterns for you to choose from. Now, get read to embroider a greeting for the season! To prepare the merry embroidery pattern, download and print the JPG at whatever size you want. Use your favorite transfer method to mark the pattern on your fabric. Because of the details and importance of the lines on this pattern, water-soluble stabilizer is an easy and accurate method. If you plan to use water-soluble stabilizer, you may want to print on regular paper first, just to make sure you have the pattern scaled to the size you want. Place your material in an embroidery hoop and get ready to stitch. Choose the number of strands you will use depending on the size you are stitching your design. The example embroidery fits in a 6-inch hoop uses three strands of floss throughout. For larger projects, use more strands or even perle cotton. You will need brown, one or two greens and red embroidery threads. The sample uses DMC 838, 367, 989 and 350. Stitch the branch/stems with back stitch or stem stitch. Work the pine needles with medium to dark green straight stitches. It's best to work from the outside in toward the branch, taking the needle right through the brown stitching or just under it. Variety is good. Embroider the roses in red with woven wheel stitch, keeping them slightly loose. Use red to stitch the berries with french or colonial knots. The berries are always shown in clusters of three, but you should choose if you want to stitch one, two or three knots at each location. Similarly, it's okay to add or subtract a few berries. An alternate way to make the berries is with tiny red beads stitched in place. When you have completed the pattern, look it over and consider adding some extra pine needles to fill in areas, better define the word or add some highlights. Use a lighter green for this. The lines aren't marked on the pattern, so this is an opportunity to be creative. Remove any pattern markings or water-soluble stabilizer and finish your project however you choose. Finally, be merry! Please remember, this pattern is copyright Mollie Johanson and may not be resold. You may, however, use the pattern to make and sell your own finished pieces. Thank you!